A rendering of the main airport terminal (above) once it’s renovated and has rental car customer service desks replace the current airline ticketing counters. The Long Beach Airport is set to get a major facelift after the city council voted Tuesday night to award a contract to Swinerton Builders of Los Angeles to undertake a $58 million overhaul of the airport’s main terminal building and surrounding structures. In awarding the contract to Swinerton the council commenced with phase II of the airport’s renovation with the initial work having been completed in 2012. Swinerton’s team includes three other firms including Long Beach-based Studio One Eleven. This phase will include upgrades to the ticketing counter area, historic rehabilitation of the terminal building as well as the relocation of rental car services from outside bungalow buildings to inside and the addition of pre-security amenities. The latter stages of construction will include improvements to the terminal loop, signage and the development of a new ground transportation area. 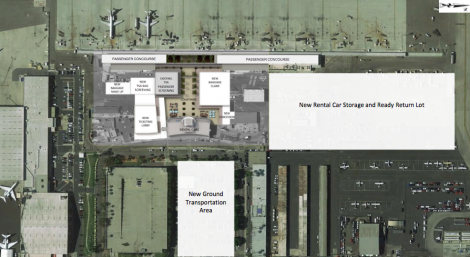 A site map of where the new installations at Long Beach Airport will go. In the updates the current rental car lot will be shifted to a new permanent lot to the north of the main airport building, which will also now house the rental car customer service counters. A new ticketing lobby will be built to the south of the main airport building where the current bag pickup station is with a new baggage carousel being constructed just outside the north passenger concourse. Swinerton, which has offices throughout the county, has worked on many notable projects in Southern California including the Los Angeles International Airport’s gateway and air traffic control tower, the Hotel Del Coronado in San Diego County, seismic renovations of two terminals at John Wayne Airport and the Mark Twain Library in Central Long Beach. Long Beach Airport Director Jess Romo said that the $65 million price tag, which includes a $6.4 million contingency for cost overruns, will be paid through a variety of sources. About $23 million will come in cash from the airport directly with another $20.5 million coming from passenger facility charges. The remaining sum of about $15 million will be split between customer facility charges and a grant from the Transportation Security Administration (TSA). 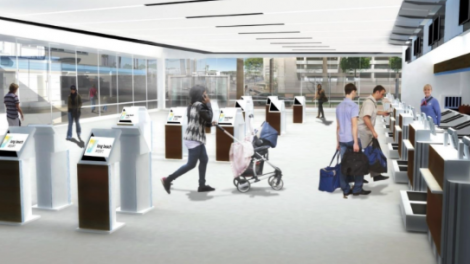 A rendering of the new ticketing counter that will be built where the current baggage claim area is at LGB. The last time the airport received this large of a facelift was about eight years ago when a previous city council greenlighted phase I of the the project which included the construction of the new passenger concourse and passenger screening facility. Those improvements opened to the public in December 2012. Romo said these improvements are likely to take three years once construction begins, something that is tentatively expected to start at the end of this year. The prioritized portions of the project will include the improvements made to the ticketing lobby, which will include more self-check in kiosks, a consolidated baggage pick-up area and TSA bag screening facility.